1) The Church is made up of fallen human beings. Though redeemed, we still have that sin nature that can rear its ugly head when we’re not walking in the Spirit (Gal. 5:13-26). 2) We have an enemy seeking to devour and divide. If we fail to stay alert and self-controlled (1 Pet. 5:8), Satan can gain some ground when we don’t stand our ground clad with the full armor of God (Eph. 6:11-17). 3) Any time you put a diverse group together, as God did in forming the Church (Eph. 2:13-22), we’re going to find a wide variety of opinions, preferences, and styles. We aren’t going to always agree. God knew conflict would happen in the Church. He already provided the answer to resolve conflict in the way He designed the Body to function. When we truly grasp the significance of Christ as the Head of the Body, and choose to remember it in times of conflict, we will find resolution. When we understand how each one of us answers first and foremost to Him, it affects how we handle ourselves. And, it also affects our motivation. We’re no longer out to prove who’s right and who’s wrong but to work at getting on page with Him. When we truly grasp the significance of our bonds in Christ, and choose to remember it in times of conflict, we will get beyond our differences. As members of one another we will learn to have the same attitude or mindset of Christ who humbled Himself and became a servant (Rom. 12:5; Phil. 2:1-8). We will learn to “be devoted to one another in love. Honor one another above yourselves” (Rom. 12:10). Leaders, keep reminding people of who we are in Christ. Don’t wait for conflict to arise to teach about and live in accordance with these truths. 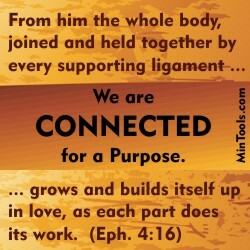 Lay the groundwork so when conflict comes, a reminder may be all it takes to act like the Body God designed us to be. Leaders, model this kind of reciprocity. You too are a member of the body, not the head, which means you shouldn’t use your position as a platform for coercing others to see or do things your way. And, when helping members in their conflicts, don’t take sides. Rather, remind each person of their responsibility to do their part regardless of what the other person does. This entry was posted in Conflict Management .